Drutex S.A. - Pressroom - DRUTEX PRESENTS ITS OWN, ORIGINAL DESIGN OF FRONT DOORS. DRUTEX PRESENTS ITS OWN, ORIGINAL DESIGN OF FRONT DOORS. DRUTEX has developed its own original door fillings systems for PVC doors. The company offers a wide choice of PVC doors both in Iglo 5 and Iglo Energy systems that stand out for modern design in line with current architectural trends. 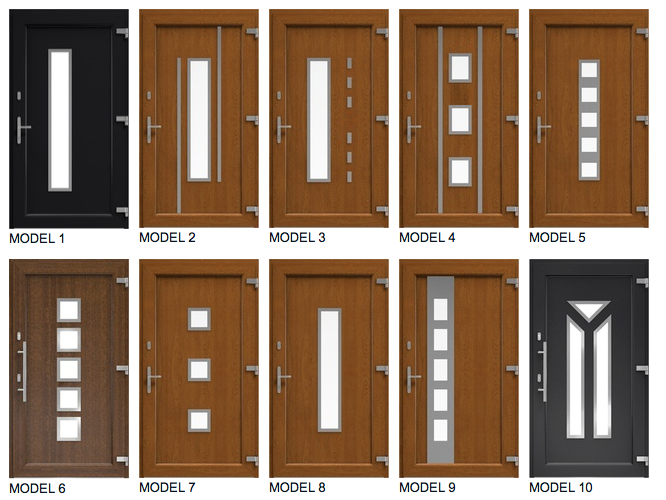 The company already offers ten own models of modern front doors in various PVC systems depending on the Client’s needs. Top quality and functionality of the available door solutions are embodied by their structure. Each door model is made of HPL2 plate/PUR foam/1mm aluminum sheet/ PUR foam/ HPL2 plate. The applications are made exclusively of stainless steel with various decorations, and thanks to the two-sided use, the doors look great both on the outside and on the inside of the room. The filling thickness is as much as 36 mm. The wide color range of the doors combined with the possibility to choose among numerous door panels and various additional options that may vamp up our door design, enable to fully customize the project. There is a possibility of intelligent control of the door, opening and closing it – with a fingerprint reader, Bluetooth, remote control or a tablet.